"Guns," "pythons," "Thunder and Lightning," however you refer to them, the biceps are glamor muscles, and many who train with weights seek big ones. Building biceps that fit snugly in your T-shirt is best done by targeting both heads of the muscle -- the short and long. Dumbbells are all you need to increase the size of your biceps. Plan your workout strategy. It has been traditionally believed that to build muscle size, the best strategy was to perform a low number of repetitions, about six to eight, with a large amount of weight. However, there are now plenty who disagree, and some say doing the opposite -- lifting a small amount of weight a greater number of times -- is more effective. Try both methods and determine which works best for you. Regardless, the most important thing is to maintain proper form while lifting with dumbbells. Perform incline dumbbell curls. Sit on an incline bench positioned at 45 degrees with a dumbbell in each hand held at arm's length. Keep your elbows tight to your torso. Initiate the movement by flexing your elbow and curling your right hand toward your shoulder. Keep your upper arms still as you lift and turn your palms upward. Flex your biceps fully at the top of the movement and pause briefly. Lower the weight to the starting position. Repeat with your other arm. Perform hammer curls. 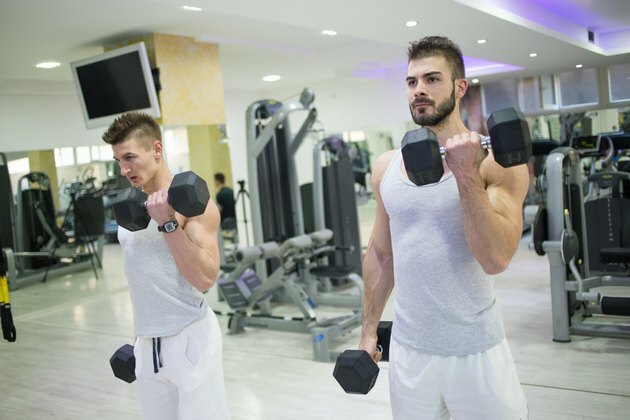 Stand while holding a pair of dumbbells with your palms facing in. Raise the right dumbbell to shoulder level as you flex your bicep. Squeeze your bicep at the top of the movement and hold momentarily. Keep your elbow stationary throughout the movement. Lower the weight to the starting position and repeat with your left bicep. Increase the difficulty of this exercise by altering the starting position so that your elbow is bent at a 90-degree angle, forcing both of your biceps to contract throughout the exercise. Perform standing concentration curls. Stand and place most of your weight on your right foot. Place your left foot, with only your toes on the ground, about 18 inches behind your right foot. Bend at your waist so that your torso is nearly parallel to the floor and hold onto something with your left hand, such as a weight rack. Grab a dumbbell in your right hand and hold it above the front of your right foot. Curl the dumbbell to your left pectoral muscle. Hold and squeeze for two seconds. Return the dumbbell to the starting position. Perform your repetitions then repeat from the other side. Incorporate your biceps workout as part of a regimen that targets your other muscle groups to ensure a uniform look. Do not overwork your biceps; muscles need time to rest and recover. Target your biceps two or three nonconsecutive days per week to increase their size.